What’s “best” to me may not be the same as what’s “best” to you or to anyone else. But, from all the comments I’ve read on the subject, a LOT of people seem to feel that the best things in life really are the “free stuff”. As far back as I can remember, my mom taught me that the best things in life aren’t necessarily tangible things! Mom – as do I – always treasured things like feelings, thoughts and expressions of caring. A smile or a hug or a strong, loving, family bond (be it by blood or by choice) have always been very important “best things” too. All of these kind of things are given and received freely…at no monetary costs. I’ve tried to teach these “values” to my kids also – as my mom taught me and her mom taught her – now my daughter teaches these values to her son. Chivalry, courtesy and civility are not dead – nor can it hibernate, as long as we continue to teach it to each new generation! In the Fall season of 1981, after the over-whelming response to her 1st appearance on the Phil Donahue Show – Mom was repeatedly laying her head on her desk, “in tears of anguish and fatigue”, as the family-operated, dining-room-table business went from “rags-to-riches”, in terms of public response to her creations. But, fame was not all it was jacked-up to be; and, it was taking its toll on everyone! 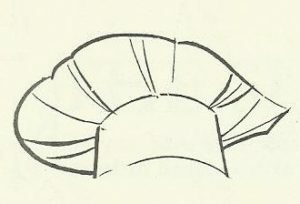 The cookbooks couldn’t be printed fast enough, to fill all the orders that were continually coming in; some customers were upset that they hadn’t received their orders, due to all sorts of confusing reasons; and the family was stressed-out and crumbling apart from all the related fall-out of “fame”. Hence, I left home early (just before my 17th birthday), running away with a boy of whom my parents disapproved. Mom and Dad thought that, by moving to the Los Angeles area with my younger sister (near one of my older brothers, Mike, and Mom’s oldest sister, Hazel, and her family), they could all have a new beginning and leave all their problems behind, in St. Clair. As I did, in moving to the Houston area with my boyfriend. All of us soon realized we were mistaken – about what we thought we wanted/needed and how to go about getting it. In California, it wasn’t long before Mom and Dad started missing the things about St. Clair that originally attracted them to move there from Algonac, in the first place…the friendliness of the town, the security of walking the streets without fearing harm, the simplicity of her small-town life. As much as they loved being near their family members, out there, that they rarely got to see, Mom couldn’t work or create in California! The peace and contentment she sought, but couldn’t find there, made her suddenly re-appreciate the freedom she had of living in a small, mid-west town, and she was eager to go “home”. She went back to what she loved best – writing and radio “visits” that kept her connected with her “readers” and “listeners”. During that same time period, while I was on my own journey in the Houston area with my boyfriend, I also found that to be so true. It wasn’t long before I realized that being in a new place with my boyfriend was not making either of us happy. After 5 months in the Houston area, my boyfriend and I, along with another couple, moved back to our hometown area in Michigan. But, things still weren’t good/better for either of us. I was looking through rose-colored glasses at something that was just not meant to be. Mom found out, through friends of mine, where I was living and how I was struggling. She started sending me little, anonymous, “angel” cards with a $20 bill – no return address or any writing other than my name and address on the envelope. I knew it was from her, even though the writing was “disguised”. Angels were our “connection”. While the money did help – that I cannot deny – it was the “anonymous” angel cards, themselves, that meant the most to me. She was reaching out, without any pressure or judgement. After my boyfriend and I split up, circumstances led me back to a loving and forgiving relationship with my parents. Back to the best things in life – as I said in the beginning – things like feelings, thoughts and expressions of caring. A smile or a hug or a strong, loving, family bond (be it by blood or by choice) have always been very important “best things”! They are the things that truly make me happy…given and received freely…at no monetary costs. 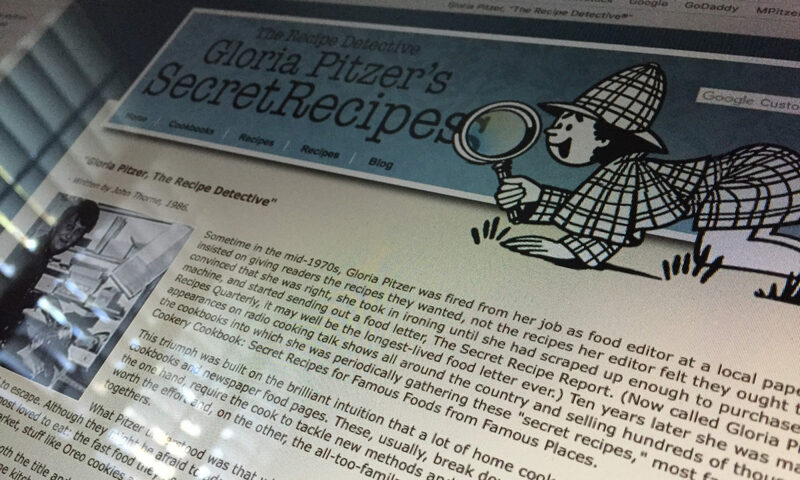 Before Mom hung up her hat and magnifying glass and fully retired, (in exchange for a self-addressed, stamped envelope) she was graciously giving away “free” sheets of 12-20 of her “best”, most popularly requested, recipes and information on what publications she had in print and how to get them. All her recipes are copyrighted; and one thing she always asked for, when she gave permission to copy, was to give her the proper credit for it. 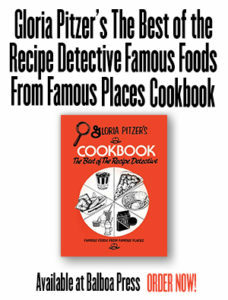 I am going to share one of those recipes with you each week, here in my blog, as they also appear in her last book, “Gloria Pitzer’s Cookbook – The Best of the Recipe Detective” [published by Balboa Press (January 2018, 1st Printing) – a re-write of her famous, self-published book, “Gloria Pitzer’s Better Cookery Cookbook” (May 1983, 3rd Printing)], asking only for proper credit if you care to share it. In last week’s blog, “More than 15 Minutes of Fame”, I shared her “Big Bucket In the Sky Chicken” recipe, which was also on the “free sheet”. This week, as “Pumpkin Season” begins, I’d like to share Mom’s favorite butter pie crust recipe from that “free sheet”, which is also found in her last book (cited above) on page 243. As soon as the butter is melted, and while it’s still hot, dump in the remaining ingredients: 1 tablespoon sugar, ½ teaspoon salt, ¼ teaspoon cinnamon and 1 cup all-purpose flour. Turn your electric mixer on high and beat mixture in a bowl for about 30 seconds or until it comes away from the center and hits the sides of the bowl. Quickly gather it into a ball and pat it out to cover the bottom and sides of a Pam-sprayed, 10-inch, Pyrex pie plate. (Pyrex plates work best with this very rich recipe.) If you don’t have Pam, grease the pan in Crisco only! It might stick otherwise! Bake crust at 375°F for 18 to 20 minutes or until golden brown. Fill as desired. Makes one 10-inch pie crust. Note: Do not double this recipe. The dough becomes difficult to work with as it cools and, then, it crumbles and breaks apart. Make one single recipe at a time. To make top crust: Pat out a single recipe, as given above, on a Pam-sprayed and waxed-paper-lined dinner plate. Invert crust over filling spread in crust-lined pan, per recipe of your choice. Lift off plate and peel back waxed paper. Make slits for steam to escape. Gently press crust to rim of pie pan with a floured fork (or a fork dipped in ice water.) Use an egg-wash if you wish (one egg yolk, beaten with 1 tablespoon cold water and brushed lightly – lapping it, rather than pressing it, over top of crust), but the butter in this crust should allow it to brown beautifully without the wash. Bake per filling recipe directions. Generally, the best temperature is at 375°F for 25 to 28 minutes or until filling begins to bubble up through the slits in the top crust in the crust is golden brown.